This band method was created by renowned composer and music educator Frank Erickson. 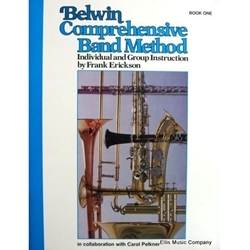 Book One of the Belwin Comprehensive Band Method correlates individual instruction with group instruction and features two methods in one: Part One for individual or like instrument instruction and Part Two for band class instruction. Originally published by CPP Belwin, this method is no longer in print, but we have a limited number of copies remaining. Once they are sold, we will be unable to get additional copies. Get this book while you can!